We've now made it simpler than ever to collect one-time or recurring payments from your clients. All you'll need is a working PayPal account, which you can link up with a TrainerFu training package to start collecting payments, right away. In this article, we'll explain how you can link your PayPal account with a TrainerFu package, and how the payment workflow makes it simple for you to automate the billing. Configure a tracking package, based on the plan that you're selling. This includes giving your training package a name and description, followed by assigning your clients the relevant group, plan template and trainer. You can read more about the setup process, here. Once you've configured the package, the next step is to enable payment for the training package. You can enable it by checking on Require Payment (PayPal). After you check the box, you'll be asked to enter your PayPal email id. This is the account on which all the collected payments from your clients will be sent. Please note that TrainerFu doesn't charge any additional transaction fees on PayPal transfers. However, you might need to comply with PayPal's processing or transaction fees for all the collected payments. 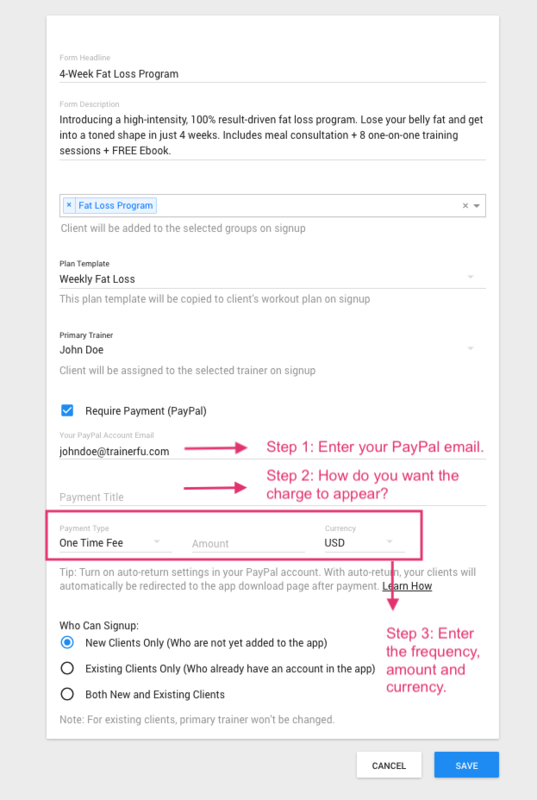 We recommend evaluating PayPal's processing fees and terms, before linking your PayPal account with TrainerFu training packages. Next, you'll be asked to enter Payment title. This is how the charge will appear on your client's credit card, and also in your transaction history. We recommend keeping it in the format <Plan_Name> + <Your_Gym_Name> + <Duration of training> (example: 4_Week_Fat_Loss_Program_Gold_Gym_1Month_Plan), so that the payments are easier to track for everyone. That's it. Configure the option on who can signup for the created plan, and click on Save when you're done setting it up. Tip: We recommend turning on auto-return settings in your PayPal account. With auto-return, your clients will automatically be redirected to the app download page after they make the payment. Here's a tutorial on how to enable auto-return on your PayPal account.